The Cabinet took some key decision today which was announced by Arunachal Chief minister Pema Khandu in his speech on 70th Independence day Celebration. The cabinet ratified and directed all the commissioners and secretaries to come out with a time bound action plan for their implementations. Specific directives were issued to all the department concerned for preparation of a holistic roadmap to ensure successful and timely implementation of all the announcements. 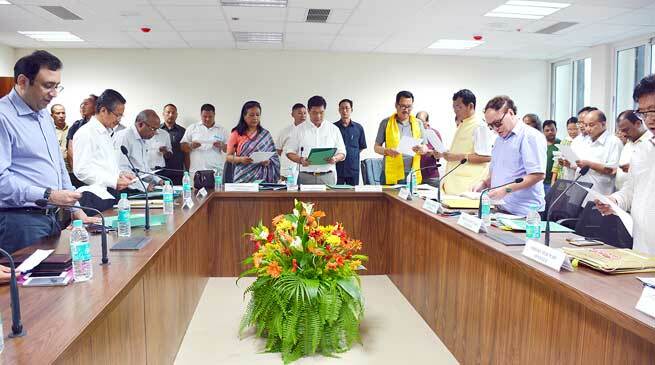 The Cabinet further approved summoning a special session of the Arunachal Pradesh Legislative Assembly to ratify the amendment to the constitution of India falling within the purview of clauses (b) and (c) of the proviso to clause (2) of article 368, proposed to be made by the Constitution (One Hundred and Twenty Second Amendment) Bill, 2014 as passed by both Houses of Parliament. GST implementation will ease the process of Registration, Return Filing and Refund Claims as all will be done electronically through an online system. GST will reduce the burden of tax on consumers by totally eradicating ‘Tax on Tax ‘(Cascading effect) and multiplicity of taxes. Arunachal Pradesh is going to benefit in coming years as being a largely consuming State. Due to sustained efforts and cooperation of tax payers, revenue collection is increasing in the current financial year which will enable the state to claim a larger compensation from Government of India for revenue loss, if any, in the first five years of implementation of GST. There has been approximately 28% growth in Exc, ise revenue and approximately 25% growth in tax revenue in the first quarter of current financial year on non-reconciled figures which will touch more than 30% growth figure when it will be reconciled.